a wheat Oktoberfest? well, ive certainly never had one, stoked! effervescence on the pour is intense, very bubble, like hydrogen peroxide almost. rising and active white soda head against a hazy pale straw body. the nose on this isn't that different than other german hefe types, but has maybe a touch more density to the grain bill, and is just slightly less fruity as the banana notes go. the flavor is super light, far lighter than any other octoberfest styles ive had this year. I will say that its strange to have an ale, not a lager, filling this role. the long finish, yeasty and spiced, is seemingly more appropriate for fall, and I am surprised more brewers haven't gone in this direction. the wheat is a strange juxtaposition to the fall season though, light, pale, gentle, floral even, summer, out of place. great carbonation and lighter than almost any other beer under this label. a nice one from erdinger, not their best, but a clever new twist (for me at least) on a classic style. 330 ml bottle into weizen glass, best before 5/2014. Pours hazy bright golden amber color with a 2-3 finger dense and rocky head with great retention, that reduces to a nice cap that lasts. Spotty foamy lacing clings down the glass, with plenty of streaming carbonation retaining the head. Aromas of lemon, orange, pear, apple, clove, pepper, light banana, wheat, bread, floral, grass, herbal, and yeast earthiness. Nice and pleasant aromas with solid complexity and balance of malt and fruity/spicy yeast notes; with decent strength. Taste of lemon, orange, pear, apple, wheat, toast, bread, honey, light banana, light clove, floral, herbal, and yeast earthiness. Lingering notes of citrus, light fruits, wheat, toast, honey, floral, herbal, and yeast earthiness on the finish for a good bit. Good balance and solid complexity of malt and yeast ester flavors; with good robustness and zero cloying flavors after the finish. Medium-high carbonation and medium bodied; with a moderately creamy and smooth mouthfeel that is nice. Alcohol is very well hidden with minimal warming present after the finish. Overall this is a pretty good hefeweizen. Solid complexity, balance, and robustness of flavors; and very smooth to drink. An enjoyable offering. Pours hazy and golden with a very wide white foam head. Smell is right for the style, banana, cloves, wheat, yeast, the works. Almost no hops. Taste is balanced and right for the style again, low bitterness, refreshing and a little bit spicy. Took me a while to diferenciate this from the traditional hefe, but as it gained temperature more spices appeared and flavor changed. Nice beer. What to make of this O-fest wheat? Getting out of context is what American crafters revel in, so it is interesting to see a traditional Bavarian institution mixing styles. I get enough wheatiness and enough ale yeast aromas and cloudiness to know this is a weiss. But in the tradition, the O-fest is a lager and orange and clear... none of which Erdinger's rendition is. While outside the O-fest tradition, this beer is hardly wrong. Instead, view it as an enjoyable reminder that O-fest, too, can experiment beyond tradition. A good reminder, I will have this Erdinger next year. A: Golden with a light haze like sunset, 2 fingers of yellow tinged creamy head. Very little carbonation. S: Malts, light astringency, apples, a light sweet fruitiness like Chinese pears. T: Big maltiness, light sweetness, an almost Belgian tripel quality only much lighter. M: Light, bready like white bread, light sweetness relative dry finish due to fine low level almost powdery carbonation. O: Really enjoying this brew I found on Wishbeer.com in Bankgkok. Drank with German sausages and salad in Chiang mai, Nov. 5th, 2014. Appearance - This is a bright but heavy orange in color with a good head that wasn't out of control like most HWs. Smell - True to its appearance this beer has a noticeable orange citrus character with some light banana and decent yeast. Taste - Everything is here from the nose. The yeast is toned down just a bit and the banana is more prominent, but it's mixed well with the natural orange flavor. Mouthfeel - This is short of medium-bodied but bigger than light with some decent carbonation. Drinkability - This was nothing exceptional but wasn't a complete flop, either. It had a few of the HW components but didn't manage to bring it all together. It was also kind of flat, not compared to most other styles but failed to deliver on that light, fluffy feel in between the cheeks that you come to expect from a top quality example of the style. Lighter than every Oktoberfest beer Ive ever had. Its a dark straw/yellow color. Aroma is pretty clean, some grain, hay, slight bubblegum. Taste is where the magic is, incredibly crushable as well. The slightest bit of malt/sweetness coming through. Low enough where you could drink several of these. Feel is great as, slightly thick but is light at the same time (dont ask me). Appearance- Light hazy orange with a huge billowy head. Smell- Light clove/ banana with a touch of malt. Taste- Clove, banana, wheat, caramel malt. Mouthfeel- Over carbonated. Each sip produces excessive gas (burping). Flavorful more towards the backend. Overall- A mildly interesting yet mediocre beer here. A fest/ hefe blend. The flavor is just too subdued. Drinkable but I want more flavor. A : Pours a hazy golden apricot hue with 80% opacity. The head is blob-like...growing and filling the glass until it nearly spills over. The yeast action in this beer is very apparent. Four fingers, then gradually recedes with broken webs of lacing on the sides. S : I took a whiff out of the bottle and it wasn't that great, but now that I'm sitting down and nosing what's in the glass, I'm getting a ton of freshly sliced or canned pear, apple, and a faint hint of brisk wheat. My stomach is gurgling because my brain is telling me it's food. The pear note here is the strongest and undeniable. T : Some fruitiness out front, not really pinpointed to anything in particular...the cornucopia of apple, pear, and peach sort of come together as one, fighting or dancing together. Behind that is some stale wheat and a metallic yeast, with what seems like roasted malt as an afterthought. There's a copper penny flavor to it on the finish that is sort of off-putting, but it doesn't last long and doesn't inhibit the quaff of the beer. Somewhere between 3.75 and 4 here. F : Medium bodied, but light in drinkability. A tender creaminess supports the drink and a zap of carbonation comes in to bring it a heartbeat. It ends a bit dry and slightly pasty. O : I'll tell you what - I've had much worse Oktoberfest beers. However, at best this is simply a Hefeweizen with a slight roast malt character added. Do not mistake this beer for a genuine Autumn treat. It is simply a spruced up Hefeweizen to be sold during the Fall season. It's not a bad beer, just very misrepresented. Appearance: 12 oz. bottle poured hard gave rise to a tall thick head, which dissipated to nothing very quickly. Brilliantly clear dark-gold color, with strong carbonation. Smell: Very little aroma to speak of, faint hints of caramel malts. Taste: Mild munich/caramel malt flavor in the beginning, fading into a somewhat sharp dryness, partly due to the high carbonation. Very mild. Can't detect much Weissbeer quality here, although maybe a hint of the Wheaty fruitiness, but no funky yeast flavor character. Mouthfeel: Thin/medium mouthfeel with a slight creaminess. The carbonation cuts through quite a bit. Drinkability: Would be easy to put away a few of these, though carbonation is a bit high for my liking, as it detracts from the flavor a bit. Overall, this is a pretty mild beer. I'm not sure why it's called an Oktoberfest/Weizen. I've had much better Oktoberfests, and much better weizens. Cool idea, but I'd sooner spend my money elsewhere. As a general fan of Erdinger, I was very glad to find a bottle of their Oktoberfest. Pours a slightly hazy, pale yellow body, with a two-finger white head that dissipates rather quickly and leaves very little lacing. The aroma is, as expected, close to their traditional hefeweizen, but comes in low on the banana notes and nearly nonexistent in the clove arena. Still, a good citrus aroma, and there is a sweetness that seems like barley malt, but, of course, must be the wheat grain in some fashion. The flavor is equally close to the hefeweizen, but, again, light on banana, missing clove, and adding some sweetness similar to a marzen. Medium to light mouthfeel and a sweet finish. Overall, a tasty and different take on the Octoberfest beer and I like it. It pours a mostly clear and amply carbonated golden amber. Three fingers of fizzy white head sustain considerably. Crescents of lacing moon the inside of the glass. The aroma brings earthy sweet malt, slightly tangy wheat, and mild spiced banana. A little biscuit rounds it out. Upon tasting, there's a brief glimpse of caramel, sweet and joined by berry fruit and tart wheat. There's a sudden grain drop-off, and thin spicy esters are left to try to fill the void. A vague whisper of grain redux is promptly blanked by a crisp apple edge that lingers momentarily. It's just alright. Light bodied, it's a grainy buzz that tops out sensorally on the palate. I'm not sure how I feel about ambivalence, or about this beer. Of course, if it had more going on it would be easier to feel one way or the other. And yet, it has just enough flavor to drink fairly nicely, if not very well. So I'm nothing if not ambivalent about this beer. Or at least I think that's what I am...I'm not sure. This beer poured a pale opaque yellow. It was moderately cloudy, and had a foamy white head that was about 3 finger widths. The smell was very interesting. You are definitely hit with the typical wheat beer smell first, but there is definitely a hint of that toasted caramel scent that comes with the marzen style. This beer has a very light slightly sweet taste in the beginning. The middle was not as interesting as the smell. You get a hint of that Oktoberfest taste, but not much. The finish is full of that banana taste that you find in many wheat beers. The mouth feel is very good. It is a smooth light beer without the chalkiness that you find in some wheat beers. Overall, if you really want an Oktoberfest, this isn't it. However, if you want a Wheat Beer during Oktoberfest, this is a good choice. Pours a cider orange with a mid size tan head. There are furit and malt notes in the nose that are faint but very inviting. The taste lightly malty with a touch of apple and banana. I wish this had a little more substance to it. This is a nice beer in the mouth. The carbonation sucessfully bites you back as you drink. There is also a slightly hoppy finish that leaves me wanting more. While the aroma and flavor lack the substance I would like, this is a nice beer that is very easy to drink and enjoy. Equal parts tangerine and goldenrod with a serious shortage of yeast, even after the final few ounces are added. The whipped creamy crown is large, filling more than half the glass after the pour. This hefeweizen may not be a knockout in the looks department, but it's nothing that deserves to be hidden in a stein. I'm curious about whether a beer that is presumably a hybrid of two such disparate styles will favor one or the other when it comes to smell and taste. The nose is most reminiscent of a weak Oktoberfest. It's mildly malty, with a wheaty tang and no banana or clove. 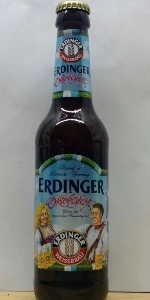 Erdinger Weissbrau brews nothing but wheat beer (hence their name), which is why they've done something so seemingly strange as create an Oktoberfest Weizen. To my unending surprise and delight, they've actually managed to create a beer that has the qualites of each of those styles. The malt tastes slightly toasted and lightly caramel-like, something not usually found in a hefeweizen. The fruit and spice that are absent in the nose are present on the palate, albeit in muted form. Clove esters are next to absent and the (hefe) weizen banan-o-meter score is only 1.0/5.0. Although relatively light, the mouthfeel features a featherweight, mouthfilling creamy quality that more light-bodied beers should possess. Proper carbonation, as always, is the key. Erdinger Oktoberfest Weizen may not be great beer, but it gets points for originality. It looks like I haven't scored anything from these guys very high. This one is as good as anything they brew. Pours a murky light yellow with a huge 3 inch bubbly white head that settles to a small cap. Thin broken rings of lace form on the glass on the drink down. Smell is of wheat, mild spices, and yeast. The smell is nothing special - a very typical hefeweizen smell on this one. Taste is so much better with wheat, banana, and a nice level of mild spices. There are also some nice caramel notes. This is the first hefeweizen I have had that I can really taste a distinct banana flavor that isn't solely in the background. The carbonation level is good with a crisp and clean mouthfeel. Overall, this is a good hefeweizen with that nice banana flavor that I am digging. I will probably go back and get some more of these.